Fewer people have considered the early life of John H Watson in any depth. 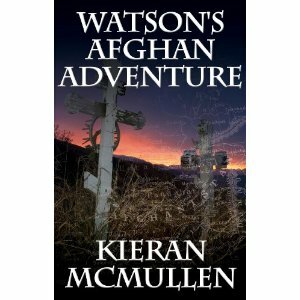 Kieran McMullen, author of Watson’s Afghan Adventure (MX Publishing, 335 Princess Park Manor, Royal Drive, London N11 3GX; http://www.mxpublishing.co.uk and http://www.mxpublishing.com; £9.99 / €12.99 /$16.95) is a former professional soldier and a specialist in American military history – an appropriate person to tell of Watson’s experiences asan army surgeon. A confrontation with the CO leads to his being, as he said later, removed from the Fighting Fifth and sent to join the Berkshires, who have an appointment at Maiwand. But Watson and a couple of fellow-officers have set themselves additional task: to search for the lost treasure of the Armenian Catholic Church. Catholicism is essential to the Watson of Mr McMullen’s story, though Conan Doyle’s Watson gives no indication of any particular religious faith. The novel could do with better proof-reading, but it’s exciting, and full of authentic military detail.